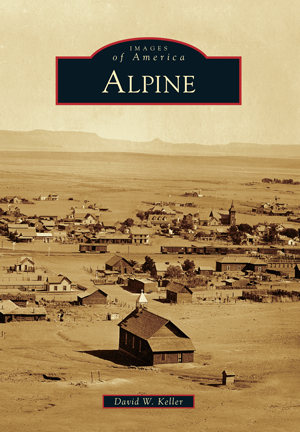 Alpine was born a railroad town, but long before the whistle of the steam locomotive broke the silence of Alpine Valley, the nearby spring was a favored campground for prehistoric nomads and later for Spanish explorers and freighters along the Chihuahua Trail. When the Southern Pacific unfurled its line down from Paisano Pass in 1882, landowner Thomas Murphy saw opportunity and platted the town. In 1887, Alpine was chosen as the county seat, and with the opening of Sul Ross Normal College in 1920, the town became the academic hub of the region. Following a decade of prosperity, the Great Depression and recurrent droughts triggered a slow decline. But since the early 1990s, Alpine has enjoyed a surge in regional art and culture, allowing it to reclaim its former glory as a proud little cosmopolitan cowtown perched at the top of the Texas Big Bend. Author David W. Keller is an archeologist and historian at the Center for Big Bend Studies at Sul Ross State University. He is the author of Below the Escondido Rim: A History of the O2 Ranch and a forthcoming book on the history of Pinto Canyon. He lives in Alpine's historic Pueblo Viejo.